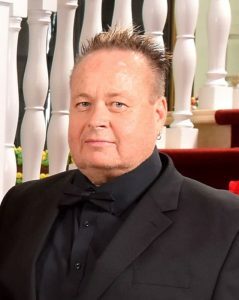 Kent Charles Moore of Palm Springs, California died on April 08, 2019 at the age of 54. He was born on January 19, 1965 in Preston, Idaho. Kent was the second child of five of Jerry and Sonja Nielsen Moore. Kent graduated from Preston High School in 1983. After graduation he moved to Logan, Utah for a couple of years and then moved to Southern California to pursue an acting career. Eventually Kent moved to the Palm Springs area. Kent loved the Southern California life style. While living in Logan, Utah Kent met Eric White and they became very good friends and moved to California together. While living in California, their friendship turned into love and after many years together they became partners in life on August 30, 2003. Kent worked for years as a maître d’ at a high end restaurant in Los Angeles, where he learned the trade and became a certified Sommelier. For a short time Kent and Eric owned their own restaurant in the Los Angeles area, until Kent’s health required them to sell. Kent is preceded in death by his husband, mother, sister Sandra, and grandparents. He is survived by his father, brother Craig (Jeanene), sisters Jeri Lin Moore and Jill Tashro (Trevis), many nieces and nephews, and his dog Foxen. Services will be held on Saturday, April 20, 2019 at 11:00 am at Webb Funeral Home, 1005 South 800 East, Preston, Idaho with a short viewing from 10:00-10:45 a.m. Interment will follow at the Preston Cemetery.